For 75 years, the U.S. Merchant Marine Academy (USMMA) has valiantly earned its reputation as an elite federal service academy. Like the other federal service academy graduates, every USMMA graduate has a commitment to serve: a minimum of five years on U.S. Flag Fleet merchant ships and a minimum of eight years in an Armed Forces reserve unit. Watch our video to learn more about U.S. Merchant Marine Academy graduates’ dedication to service. During wartime, over 90% of the licensed merchant mariners who are required to report for military service and assist in wartime efforts are USMMA graduates. The U.S. depends on these committed mariners to move weapons, ammunition, troops, equipment, fuel and supplies. Without this guaranteed pipeline of skilled, expert and committed merchant mariners, the U.S. military would be unable to execute wartime operations around the globe. During peacetime, USMMA graduates serve as licensed officers on commercial flagship vessels which transport goods and products around the world in service of U.S. economic growth. While operating on commercial vessels, USMMA graduates make up over 80% of the U.S. Navy’s Strategic Sealift Officers (SSO) program. These licensed merchant mariners can be called on at any moment to support critical sealift maritime operations in times of national defense and emergency. We count upon their efficiency and their utter devotion to duty; they have never failed us yet. And in all the struggle yet to come, we know that they will never be deterred by any danger, hardship or privation. This motto is emblematic of Sea Year, the U.S. Merchant Marine Academy’s signature training program. Sea Year is an immersive program in which U.S. Merchant Marine Academy students, known as “midshipmen” are assigned to commercial maritime vessels as deck and engineering officers in training to learn maritime skills in a real-world environment. Sea Year is a unique and unparalleled training program that produces USMMA graduates ready to step on deck on day one with confidence, integrity and the trust of everyone on board. The Sea Year experience is fundamental to the world-class maritime education provided by USMMA and is mandated by Congress. This type of extensive practicum is unique to USMMA – nothing comparable is offered at any other college or university, including the four other federal service academies. Click here to watch our video to learn more about the U.S. Merchant Marine Academy’s unique Sea Year experience. USMMA midshipmen are required to complete a rigorous four-year program that includes 164 credit hours during their three years at the Academy and twelve months of hands-on training at sea. During their Sea Year, Midshipmen must earn at least 21 academic credits while training on a diverse portfolio of vessels such as container ships, roll-on-roll-off ships, bulk grain and ore ships, and oil tankers. In place since the Academy’s founding in 1943, the partnership between the Academy and the commercial shipping companies that take midshipmen aboard their ships for training has been one of the most successful and enduring public-private partnerships in U.S. history. Such experiences prepare USMMA midshipmen for not only a successful career in the maritime industry, but also for their service requirement upon graduation. The U.S. Merchant Marine Academy graduates highly-trained, committed Merchant Marine Officers who are dedicated to serving the nation’s national defense objectives. Like the other four federal academies (West Point, Naval Academy, Air Force Academy, Coast Guard Academy), the U.S. Merchant Marine Academy is an institution of higher education that is part of the federal government. Watch our video to learn more about U.S. Merchant Marine Academy graduates’ critical role in our national defense. As a result, all graduates have a commitment to serve upon graduation. Or serve five years active duty in any of the nation’s armed forces with an additional three years of reserve service. For 75 years, the U.S. 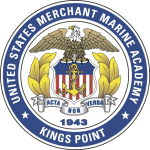 Merchant Marine Academy has delivered troops, ammunition and critical supplies in every major war. During WWII, more than 250,000 members of the U.S. Merchant Marine served their country – some 8,300 were killed at sea and 12,000 wounded. Merchant mariner casualties were greater proportionately than those of the other armed services with the exception of the U.S. Marine Corps. Because 142 U.S. Merchant Marine Academy cadets undergoing their Sea Year training on commercial ships also perished, the USMMA is the only service academy to have been awarded a battle standard. Throughout the Korean, Vietnam, Gulf War, and Operation Enduring Freedom, the U.S. Merchant Marine Academy has trained elite leaders essential to keeping our citizens safe. During the Gulf War, more than 90% of equipment, fuel and supplies needed were carried on U.S. Flag commercial and Navy vessels. Similarly, from 2009 to 2011, more than 95% of all cargoes to U.S. and Coalition forces in Operation Enduring Freedom and Operation Iraqi Freedom were carried on the U.S. Flag commercial fleet. The USMMA trains and provides the committed mariners to serve as officers on these vessels during times of national defense. The tradition carries on in those of you who come of this generation knowing that you will deliver your absolute fighting best because our country will have competent leaders of character who will be most ready when the nation may be least ready. U.S. Merchant Marine Academy graduates play a crucial role in protecting our nation and ensuring the U.S. economy stays strong. During peacetime, USMMA graduates serve the U.S. economy by operating commercial vessels that import and export cargo such as automobiles, grain, liquefied natural gas, and an array of other goods and products. Maritime transport is key to our economy, as 95% of the world’s products are delivered by ships. Maritime transportation accounts for 53% of America’s imports and 38% of its exports according to the DOT. Meanwhile, China and Russia are strategically investing in and placing greater importance on having a robust merchant marine available to move troops, weapons, supplies and fuel in wartime. According to a 2016 CIA report, the Chinese and Russian merchant marine fleets are 10 times and 3 times larger, respectively, than the U.S. merchant marine fleet. While the number of vessels in the U.S. flag fleet continues to shrink, China’s merchant fleet has grown by 30% since 2010. The U.S. cannot claim defense readiness without maintaining its strong investment in training and cultivating military service-obligated U.S. merchant marine officers at the U.S. Merchant Marine Academy. You’re going to bind the muscles of American commerce…you’re going to be the fourth arm of defense. Any industry that can accomplish what [the Merchant Marine] has done in wartime can justify its great promise in peace. When final victory is ours, there is no organization that will share its credit more deservedly than the U.S. Merchant Marine. Share the latest news and resources about the U.S. Merchant Marine Academy on Facebook and Twitter.